press release 2018.10.09 - ZYLIA PORTABLE RECORDING STUDIO. MULTI-TRACK MUSIC RECORDING WITH ONE MIC. Zylia, the Poland-based manufacturer of multitrack audio recording technologies, will present case studies on spatial audio/video creation during a workshop at AES New York 2018, which will run Oct. 17-20 at the Jacob K. Javits Convention Center. On Oct. 17, Zylia experts and guest presenters — professional audio engineers and musicians — will discuss how, in their own productions, they have combined 360-degree, 3D, and ambient sound with visual elements. Presenters at the Zylia workshop titled “Immersive & Spatial Audio: IS01 - Spatial Audio-Video Creations for Music, Virtual Reality and 3D Productions – Case Studies” will include Yao Wang, Florian Grond, Edward Wersocki and Tomasz Zernicki. Wang is a composer, sound designer, and artist who developed a passion for music at a very young age. She recently graduated from Berklee College of Music with a bachelor’s degree in music (electronic production and design, film scoring). Combining her love for music, sound, and technology, Wang provides spatial audio solutions for immersive experiences including virtual, augmented, and mixed reality (VR, AR, and MR). She artfully blends musical composition and sound design in a soundscape that completes the visual reality. In his artistic and academic work, Grond focuses on the intersections between art and science, with a special interest in sound. He is a postdoctoral fellow at the Biosignal Interaction and Personhood Laboratory at McGill University in Montreal and an affiliate member of the Centre for Interdisciplinary Research in Music Media and Technology, housed at the Schulich School of Music at McGill. He holds a master’s degree from the Karl-Franzens University in Graz (Austria) and a doctorate from Bielefeld University, Germany. He also has worked as a research associate and guest artist at the Center for Art and Media (ZKM in Karlsruhe, Germany). Wersocki is a passionate producer, composer, and sound engineer. Until recently, he worked at the Berklee College of Music in the Professional Writing and Music Technology Division, where he provided technical support to faculty for classes and special events and also assisted students with hardware/software operation and curricular concepts. At the moment he works as a technology systems specialist at Emerson College, the nation’s premier institution of higher learning devoted to communication and the arts. 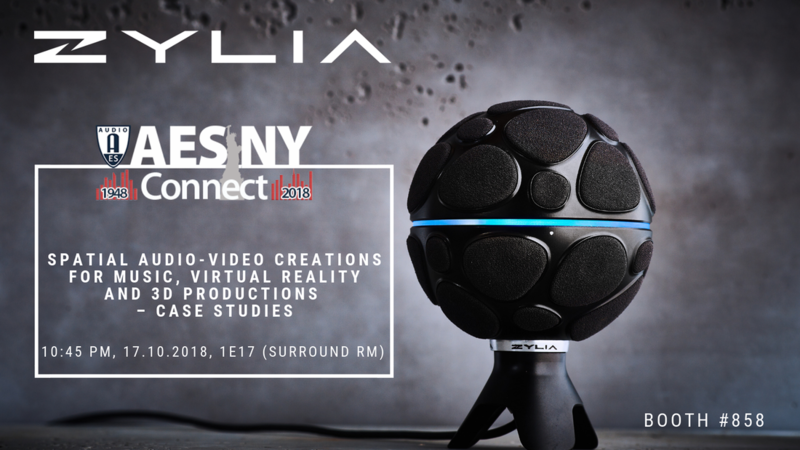 Zernicki and other Zylia experts will be on hand throughout the AES New York 2018 conference to discuss 3D/360 sound applications, as well as the company’s ZYLIA ZM-1 spherical microphone array, ZYLIA Studio PRO VST/AU plug-in, and ZYLIA Ambisonics Converter. Further details about AES New York 2018 are available at http://www.aes.org/events/145/. More information about Zylia and its technologies is available at www.zylia.co.